Sunday, September 18, is the 69th birthday of the United States Air Force, which became a separate branch of service as part of the National Security Act of 1947. Despite being the most recently created branch, the air force traces its heritage to the very start of U.S. military aviation in 1907 with the U.S. Army Signal Corps. Not to steal the thunder of our colleagues across the National Mall at the National Air & Space Museum, but our museum has more than a few objects that relate to the history of the air force. To celebrate the air force’s birthday, I thought I’d share a few of my favorites. General William “Billy” Mitchell is called the father of the air force, and for good reason. Years before his visionary use of air power at the Battle of Saint-Mihiel in World War I, his demonstration showing that aircraft could sink a battleship in 1921, his tireless promotion of air power, and his infamous public court-martial, then Lt. Mitchell went to Alaska as part of a signal corps mission to lay the first telegraph line across the territory. 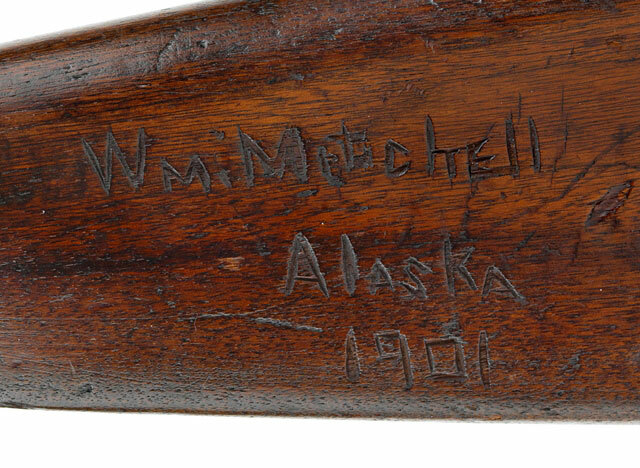 This Winchester model 1894 lever-action carbine went with him, and bears the hand-carved inscription “Wm. Mitchell / Alaska / 1901” on the stock. The first American pilots in World War I went to war without their country, which was still neutral in the conflict. They volunteered with units like France Air Service’s Lafayette Escadrille, a fighter squadron formed in 1916. 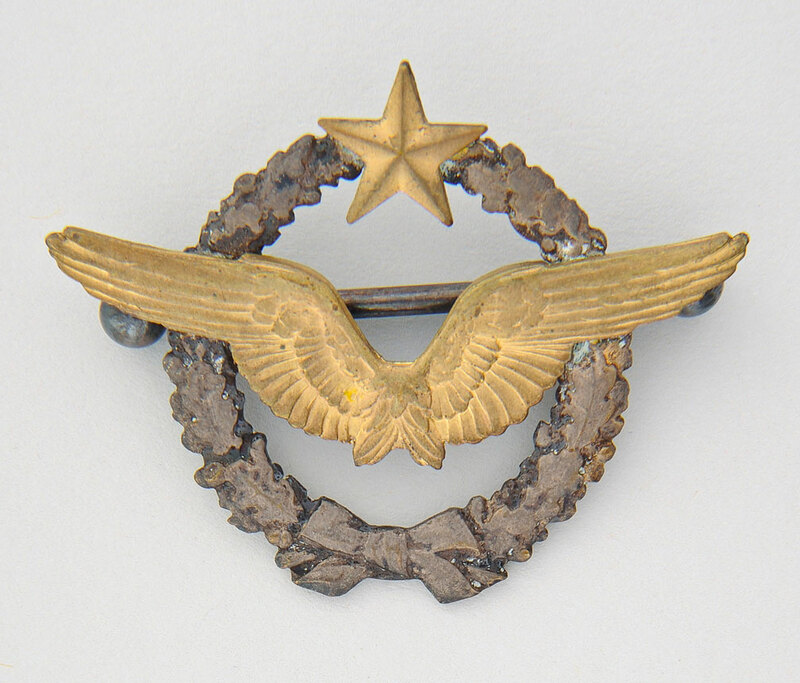 Escadrille pilots were largely, but not entirely, expat Americans, and wore a pin like this one. The Escadrille would serve as inspiration for volunteer American fighter squadrons in World War II such as Eagle Squadron in Britain and the Flying Tigers in Burma. 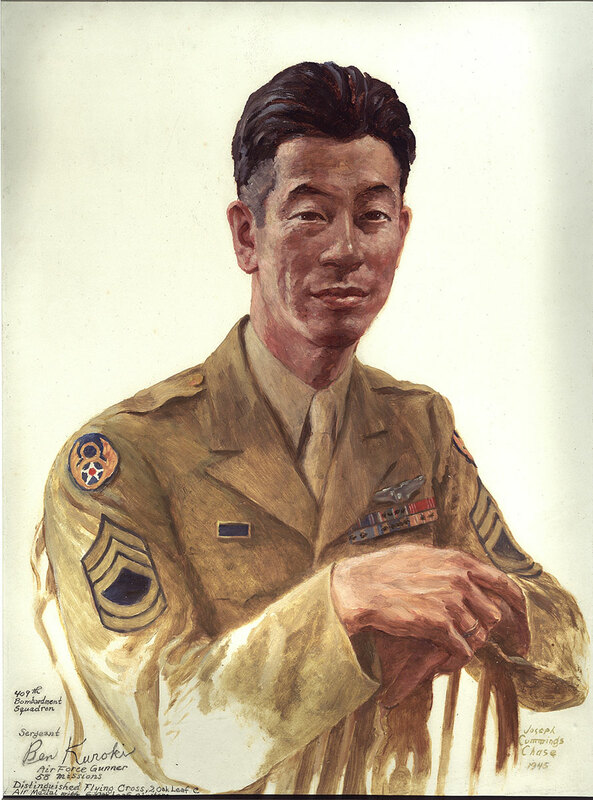 Technical Sergeant Ben Kuroki was the only Japanese American citizen known to have served as a combatant in the Pacific Theater as part of the U.S. Army Air Forces during World War II. After repeatedly requesting to serve in combat, he trained as an aerial gunner and completed his 25-mission requirement as a B-24 crewmember in Europe and North Africa, a tour that included the deadly 1943 raid on the Ploiești oil refineries in Romania. He volunteered for an additional five missions and was wounded on his 30th mission. After recovering, he petitioned to fly in the Pacific Theater, a request that was only approved by the intervention of Secretary of War Henry Stimson. Sgt. Kuroki flew 28 more missions as a B-29 gunner. His service earned him three Distinguished Flying Crosses and six Air Medals. This oil painting is one of a series created by Joseph Cummings Chase, who documented Americans serving in the war. The museum also has Sgt. Kuroki’s wartime journal. The new air force had been formed in 1947 but, as had been the case in the U.S. Army Air Forces, rank titles and insignia remained the same as in the army. That began to change after March 1948, when the service adopted its own distinct enlisted rank insignia. 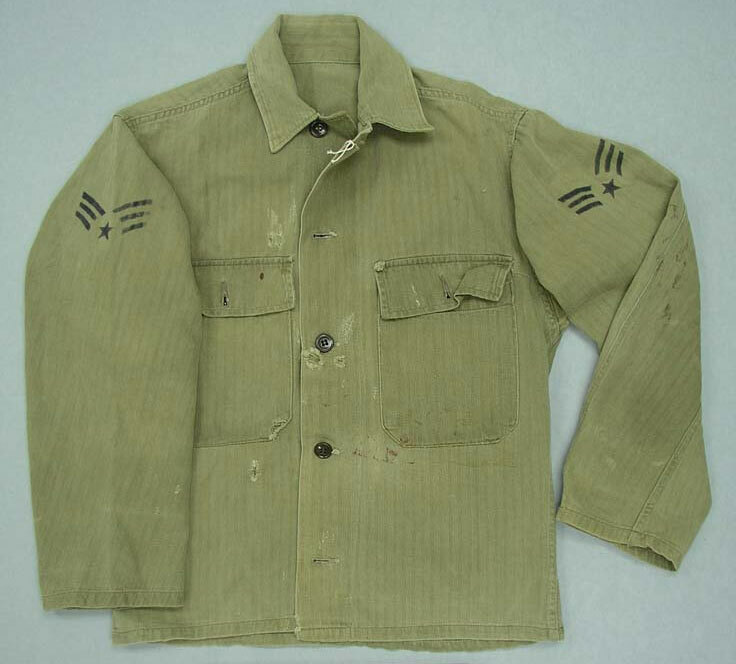 This Model 1944 uniform shirt is a herringbone twill that has the post-1948 rank chevrons stenciled on the sleeves, though the rank was still called “sergeant” until 1952. Many years before G.I. 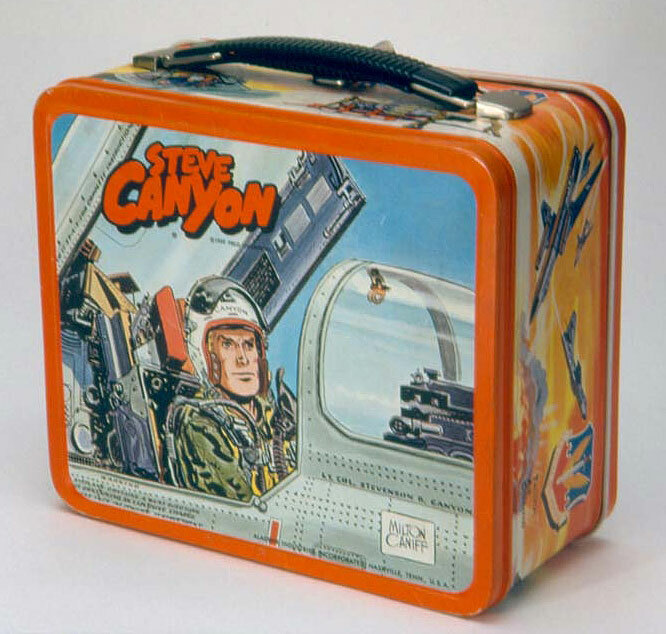 Joe was a “Real American Hero,” Steve Canyon was teaching kids that the life of a pilot was super cool. Tapping into the image of pilots as modern cowboys and the novelty of jet-powered aircraft in postwar American culture, Milton Caniff created the serial comic strip Steve Canyon in 1947. It followed the adventures of a veteran U.S. Army Air Forces pilot as he battled pirates, criminals, and assorted villains around the world. Steve Canyon would rejoin the air force during the Korean War as the strip began focusing on new Cold War enemies. The award-winning strip continued until Caniff’s death in 1988. This steel lunch box, including thermos, was made by Aladdin in 1959. Women pilots were not new to the history of the air force. In World War II over 1,000 Women Airforce Service Pilots (WASPs) flew aircraft in non-combat roles as part of the war effort, and the air force began accepting women into pilot training again in 1976. However, women pilots remained limited to non-combat roles. 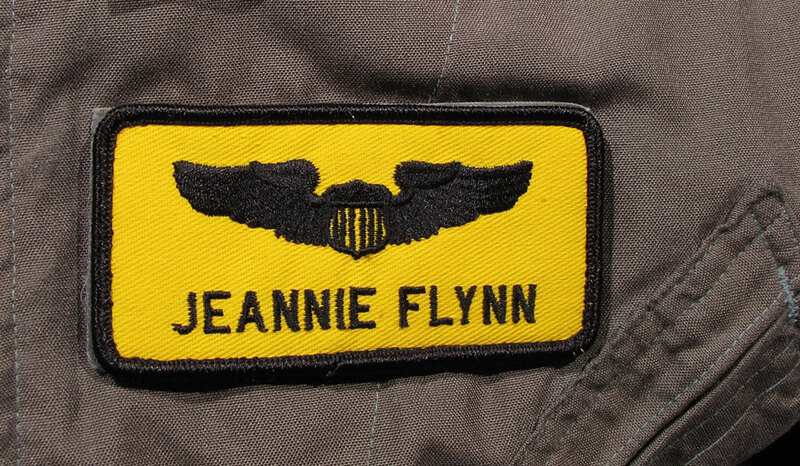 That restriction was lifted in 1993, and soon afterward Lt. Jeannie Marie Flynn (now Leavitt) became the air force’s first woman fighter pilot. Since then, Brigadier General Leavitt has flown F-15E combat missions over Iraq and Afghanistan, and is currently the commander of the 57th Wing at Nellis Air Force Base in Nevada. This early flight suit with name tag was donated to the museum in 1995. Of course this is just a small sample of the objects in our Armed Forces History collection related to the U.S. Air Force, but that just leaves more to talk about next time. Happy birthday! David McOwen is the New Media Developer for the National Museum of American History, and spends his time away from the museum as an Aeromedical Evacuation Technician in the United States Air Force Reserve. He had a Steve Canyon book as a kid and still thinks flying is super cool.